"Monthly Two Day Trade Days Event (Saturday and Sunday prior to the Second Monday of each month). Offering handmade arts, crafts, new retail items, candles, jewelry, clothing, food concession, antiques and uniques and much more. Free parking and Free admission!" Directly on US 287 frontage road, three miles west of Waxahachie and seven miles east of Midlothian. 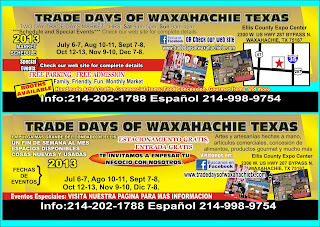 For more information, visit their website or contact their event coordinator at tradedaywaxahachie@sbcglobal.net / 972-816-3644 (Jean) / 214-202-1788 (James). If you haven't already noticed, we have switched things up a bit here on the blog. We are now using a new commenting system that allows you to sign in with your Google, Facebook, or Twitter log-in. Don't worry, you can still comment as a guest as well. Along with the new sign-in features, the commenting system also allows you to link up your shop or event, making it easy for folks to find you--if you want to be found, that is! Take advantage of this marketing opportunity by commenting on the events you are vending at to let folks know to look for you. You can also do the same on our Weekend Guides! Lastly, you can subscribe to comments with the click of a button. This is great for event coordinators who want to stay on top of any comments made on their Event Listings, as well as vendors who want to receive event updates. Just look for the "subscribe to this feed" section below each comment section (here's an example). There you have it! I'm always trying to find ways to make the site easier for you to use and get the word out about your events. I hope this helps! "Universal Academy Coppell will hold their Fall Festival on Tuesday, October 15th. There will be vendors, games, food, entertainment, basket auction and more. Come join the fun!" 1001 E. Sandy Lake Rd. Admission is free, but rides and food cost tickets, which are 50 cents each. Booths are 6 X 8, cost $50, and include chairs, electricity, pizza, and a free drink. If tables are needed, a 6 ft. table is $10 each. Applications are available here and are due by October 8th, 2013. 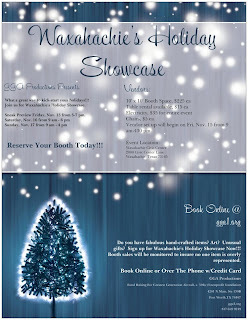 For more information, contact their event coordinator at diane.moshier@universalacademy.com / 972-393-5068. "Deluxe Winter Market is a major shopping event with free admission in Oklahoma City, where unique artists show and sell their work to enthusiastic visitors from all over the region." Applications are available here and are due by August 30th, 2013. Uncovered tables are included, along with 2 Chairs, and BNN Member Discount - $10. Applications are available here and are due by February 2nd, 2014. Applications before January 1st, 2014 will receive the EARLY BIRD discount. For more information, visit their website or contact their event coordinator at admin@tcbirthnetwork.org. "CRAFTAPALOOZAtm & Fabulous Junk Market is a one day shopping extravaganza featuring an eclectic blend of arts & crafts, bling, glam & jewels, retail boutiques, antique & vintage bliss, home décor & inspiration, reloved-repurposed furniture, along with FABuLOUS FINDS for your creative soul!" "Rockwall's premier holiday shopping event is November 2nd from 9:00 to 3:00. 'Tis the Season Bazaar and Craft Fair features all handcrafted items from vendors around the Metroplex. Seasonal decorations, home decor, and genuine one-of-a-kind gifts abound. Be sure to visit the North Pole cafe and general store for lunch, homemade baked goods, and the best pecans in Texas." These fees include free coffee and donuts Saturday morning. Applications are available here and are due by October 1st, 2013. For more information, visit their website or contact their event coordinator at k.s.bernal@sbcglobal.net. "Kick off your holiday shopping with us! Shop from a variety of merchants featuring trendy clothing, jewelry, home decor, seasonal items, gifts, health and beauty, gourmet food, inspirational gifts and more!! Concessions and hourly door prizes await our shoppers! Admission is free!" Applications are available here and are due by September 1st, 2013. For more information, visit their website or contact their event coordinator, Deborah, at ptf@tcaeagles.org / 817.732.5815. "Come support your local small businesses at the Red Oak Fun Center!! Our Market will have a variety of vendors to fit everyone's wants and or needs!" "Over 60 moms join together to sell household items, crafts & home based businesses. 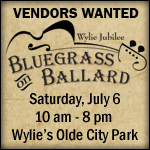 Vendors like: Paparazzi Jewelry, Mary Kay, Thirty-one and more will be there. At the Keller Lion's Club, 532 Keller Parkway, from 8am-4pm on the following days: July 27, August 24 & October 19." "Shop local handmade art at Pop-Up Market! You’ll find dozens of vendors with handmade jewelry, art, collectables and more. The really great news is that admission and parking are free! Our mid-sized shopping events are big enough to have a wide selection of items, and small enough for you to walk through with ease. Get fed by a local food truck, and bring a blanket to spread out on the lawn. Follow us on Facebook and on Twitter for updates on new markets, vendors scheduled at the Market, shopping trends and more! Pop-Up Market has already been featured by WFAA, CBS11, 360 West Magazine, Star-Telegram, The Fort Worth Business Press and North Texas Magazine!" They are accepting Handmade and Vintage Items Only. Booths are 10 X 10 and cost $45. Applications are available here and are due ASAP. Payments must be submitted by August 2nd for all accepted vendors for the August 10th event. 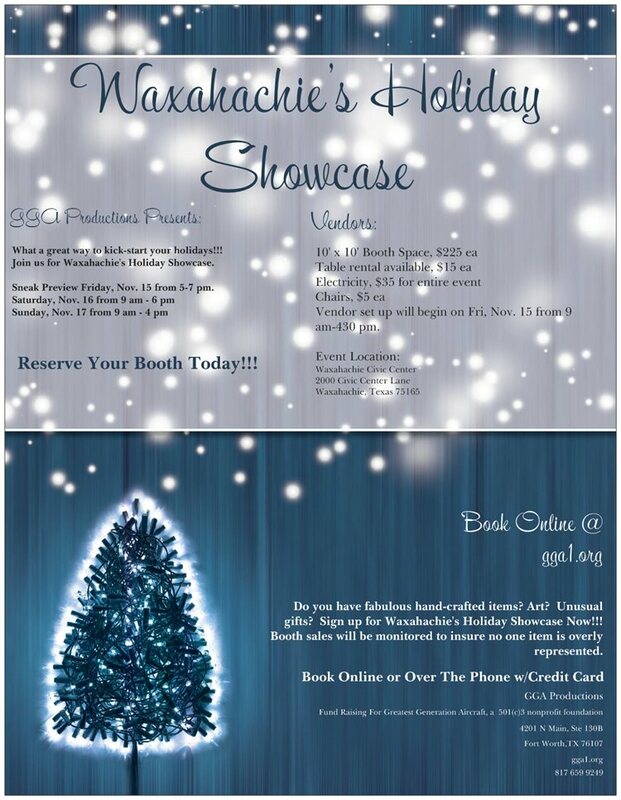 "GGA Productions has announced that they will host Waxahachie Holiday Showcase! Admission will be $8 per person, kids age 5 and under will be free with paid adult. Also, attendees can save $1 per person if they purchase their tickets online." Admission is $8 per person, kids age 5 and under are free with paid adult. Free parking. Booths are 10 X 10 and cost $225. To apply, please visit their website for more information and contact their event coordinator at waxahachieholidayshowcase@yahoo.com / 817 659 9249. 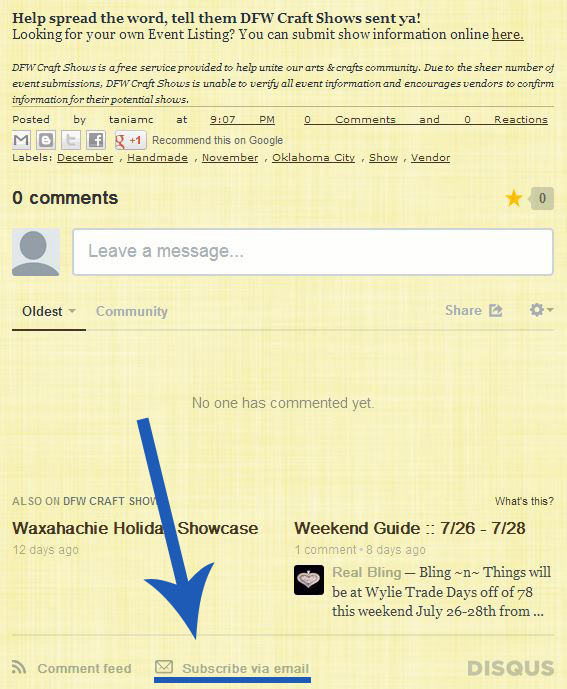 As you know, it's just me behind the wheel here at DFW Craft Shows.com. I process a lot of show information, and I try to do it as quickly as possible so you know about upcoming shows ASAP! (I know ASAP hasn't quite been what it used to, but I thank you for your patience as I try to get up to speed around family needs.) It has always been my primary goal to help Vendors, Shoppers, and Event Coordinators connect, and support the local arts & crafts community. Unfortunately, I can not guarantee the outcome of any of the shows posted. I encourage all vendors to do their research, and always guard yourself and your business. I am always sad to hear when a show does not turn out as we all hoped--traffic, sales, or otherwise. I wish there was something I could do, but I appreciate everyone understanding that these aspects of an event are simply out of my control. I am proud to say that these shows seem to be far and few between, and most of the feedback I receive is positive. It's wonderful to hear your success stories, please continue to share them with me! I love to hear how the site is helping you. Please--if you ever feel like an event is operating in a way that seems shady or unethical to you--please contact me immediately. There is not a lot I can do, but I can and will research the situation, and if warranted, cease to promote their event so others do not suffer the same fate. I hope you all feel like you can always reach out to me with your concerns, and know that I will do whatever I can to help. I want nothing but success, and happy crafting experiences for you all! 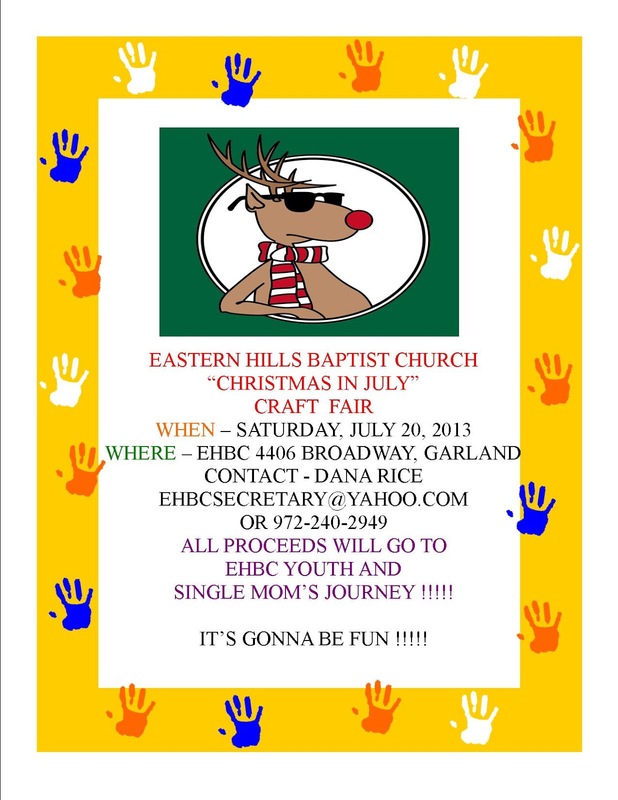 "All proceeds will go to EHBC Youth and Single Mom's Journey! It's gonna be fun!" "Outdoor Craft & Music Fest hosted by Full Gospel Denton. 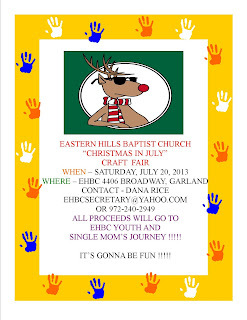 We need craft vendors, musicians, and bands to be at this event on Saturday, July 20th beginning at 8:00 AM until noon." Booths are 10 X 10 and cost $35 for an inside booth and $25 for outside. For more information, visit their website or contact their event coordinator at daisyplanning@yahoo.com. You may also contact Jessica at MessyJessiesHairBows@gmail.com. Booths are approx 5 X 8 and cost $25, or $35 with an outlet. This fee includes one table, 2 chairs, and 1 complimentary water. For more information, visit their website or contact their event coordinator at mopssaleabration@gmail.com. "It's time for the 21st Annual 2013 Southlake Carroll PTO Craft Fair! We are looking forward to another successful year as shoppers get a head start on holiday shopping. As in past years, we will feature such popular items as custom jewelry, holiday decor, boutique clothing, candles and handmade items. We are thrilled to directly support Seniors 2014-Project Graduation, an all-night event that keeps Carroll graduates in a safe, fun environment following commencement ceremonies. We greatly appreciate your support and look forward to seeing you soon!" Admission Fee is $3 adults and $1 children. Booths are 9-10 feet long by 6 feet deep and priced at $175 per booth. Applications are available here and are due by August 2nd, 2013. For more information, visit their website or contact their event coordinator at sccraftfairpublicity@gmail.com. "The CHS Lightning Dancers will host their 11th Annual Fall Gift & Craft Show on Saturday. Free fun for the whole family! This year's Gift & Craft Show will host a number of amazing vendors with unique items for everyone, as well as live entertainment and door prizes given away all day. This fun event will also include great silent auction baskets, and free Kiddie Korner crafts for the kiddos!" They provide two chairs per booth. Vendors also receive free Continental Breakfast from 7 a.m. - 9 a.m., Bottomless Iced Tea throughout the show; Free unloading/loading assistance. "Fall Craft Fair hosted by the Grapevine, Colleyville Southlake Mom's League. Grapevine Convention Center *FREE ADMISSION* Gifts, Clothing, Accessories, Home Decor and More! Face Painting, Magician, Bounce Houses, Food Trucks, J. Photography and More! A Fun Mix of All Things Cute and Clever!" Booths are 8 X 10 for $150 for nonmembers of the GCS Mom's League, $100 for members of the league. This fee includes a 6ft. table and 2 chairs. Electricity is $10 and Box Lunches $8 each. For more information, visit their website or contact their event coordinator at craftfair@gcsmomsleague.org. 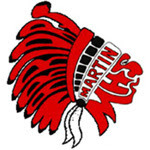 "Come & Shop Martin Baseball's 20th Annual Craft & Specialty Show, Saturday, Oct. 12th from 9am to 5pm & Sunday, October 13th from 11:00am to 5pm. Over 250 vendors with items such as Art, Home Décor, Garden stones, Candles, Apparel, Crafts, Frames, Cosmetics, Gourmet foods & so much more! Admission is $3; children under 2 free & AISD employees are free! Don't forget to stop by the Sweet Shop or check out Warrior Café! " Admission Fee is $3. Children under 2 and AISD employees get in free! Receive move-in & move-out help, and craft show will be advertised in the paper. Applications are available here and are due by August 1st, 2013 for early bird special rates. For more information, visit their website or contact their event coordinator at Tonya.Levitt@att.net.